Hull Shield: Youngest player wins oldest trophy! The team returning the lowest combined nett score shall win the shield. Handicap limit is 26 at time of entry. 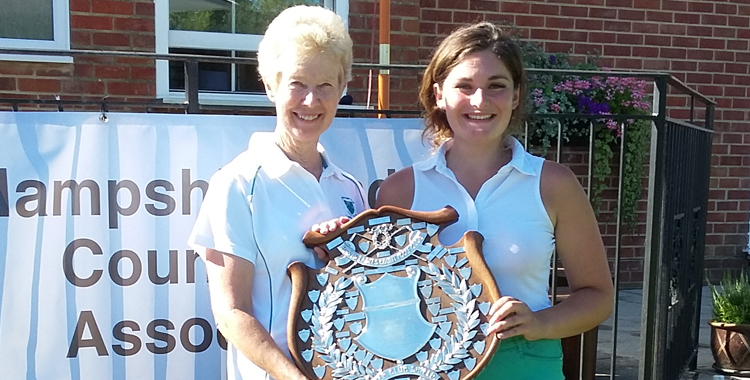 The 101st playing of the Hull Shield took place at Waterlooville Golf Club on another sunny Thursday in August. A smaller field than in previous years of just thirty six clubs played two medal rounds over a beautifully prepared course. Last Sunday’s rain had greened up the grass and an early mow produced slick greens. The Hull Shield was first played for in 1907, the same year Waterlooville GC was founded. It is the oldest competition run by HLCGA. An aggregate score from two medal rounds is usually a challenging format and so it proved, with the CSS going up to 75. One player starts on the first with the second player beginning on the tenth, this brings both players in together at the end of their round. Waterlooville put on a wonderful running buffet lunch which was enjoyed by players as they came in. The presentation saw vouchers given down to fifth place. 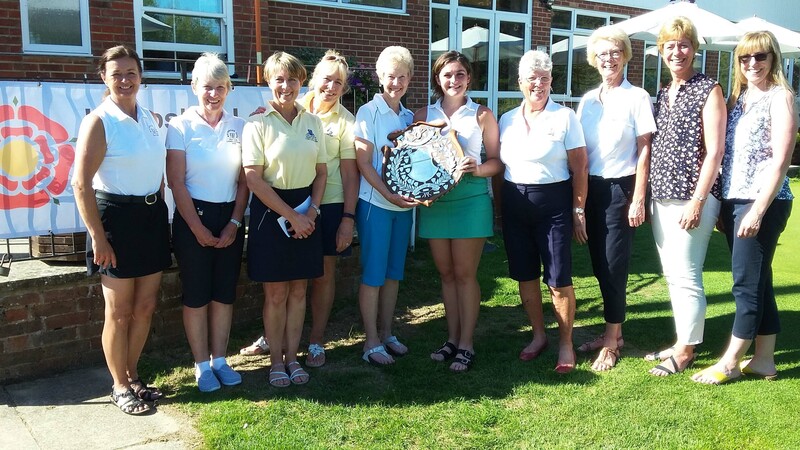 Corhampton had sent Elizabeth Butler (nett 76) and Tammy Andrews (nett 73) who produced a combined score of 149 which was enough to win the trophy by a single shot from runners up, Lisa Evans and Gill Urpens (Chilworth). Our grateful thanks to Secretary/Manager Mark Wycherley and all his wonderful staff for being so helpful and welcoming and to the ladies for ball spotting, starting the players and serving the halfway refreshments. Our 2018 County Champion Kerry Smith is a Waterlooville member and special thanks to Kerry for her sterling work organising so much of the day. Thank you Waterlooville and we’ll be back soon if you’ll have us again? !